When you are cheeky enough to make a movie that is a collective sum of brown corsets, helmets, glinting metals and over-bloated dead bodies, you've got to sidestep the major story and minor common sense. Kingdom Of Heaven is a movie that endeavors to capture the essence of medieval Asia and Europe, when the lives and lifestyles of Christians and Muslims were getting entangled. 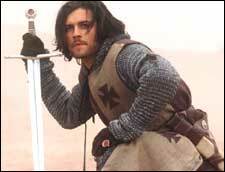 Beginning in France in 1184 AD, the film tries to build itself for a major climax, the actual crusade in flesh. Ridley Scott thought that dealing with such a gory topic, and at a time when there is overall resurrection of religious fundamentalism, would be a difficult process. So he takes out any semblance of logic from the genesis or factors responsible for the Crusades. Any debate on the rationale for the mammoth destruction is wisely overlooked. The movie proceeds in pure and simple steps, of scenes after scenes involving increasing violence and murders. Religion and heaven take a backseat early, as the main character, Balian (Orlando Bloom), feels that he is abandoned by God. He kills a priest to prove his point, and also to lay the stage for further grossness. Bloom, as Balian, makes a highly unconvincing crusader. He lacks the ferocity expected of a warrior of truth, and the determined glint of ambition in his eyes. At best, he appears a lukewarm romanticist. He displays more enthusiasm and vigor while taming the iron as a blacksmith, than on the battlefield wielding the sword. We are sure that there was economical if not ideological reason for the Crusades - but there is just one thought guiding Kingdom Of Heaven, which is that if you succeed in clubbing together a lot of dead bodies, you might arrive at a passable movie masquerading as the epic. Whatever else happens in the movie appears to be a hasty after-thought. Godfrey (Liam Neeson), the Knight of Ibelin, is making a pilgrimage to Jerusalem, and randomly decides to acknowledge and knight his son Balian on the way. Balion kills a priest, takes refuge with his father and lays invitation to a hematically choreographed fight involving a full minute of knife-piercing-the-neck shot. He set sails for Jerusalem from the port of Messina, is shipwrecked, then lost in the desert, and does a few more beheadings to keep up the show. In Jerusalem, the King Baldwin (Edward Norton) is finding it difficult to maintain truce with Salahdin (Ghassan Massoud) of Damascus. In an attempt to further glorify grimness, the king is attired in a mummy-suit, with hints at a leprosy-eaten face behind his mask. Sybilla (Eva Green), Baldwin's sister, has an eye for Balian, and offers to him, herself and the crown, with the beheaded body of her husband Guy-de-Lusignon (Marton Csokas) as an added attraction. Either it was her kohled eyes, or her proposition was not yucky enough, but Balion freaks out. Guy-de-Lusignon and his cronies provide more powder for the game; for reasons known only to them, they simply desire a war, any war. Scott would have us believe that, as the time was the twelfth century, these wars came to be known as the Crusades. Guy-de-Lusignon kills Salahdin's sister, declares war, and takes his troops to meet Salahdin's army. He succeeds in killing half his own army through en route dehydration, and ends his ambitions with his own capture. Salahdin, played by Ghassan Massoud, turns out to be an outright winner when pitted against his ludicrous enemies. Enthusing in controlled determination and leashed-in power, Massoud completely overpowers our reluctant crusader Balion in screen presence. The battle shifts to Jerusalem, and after creating an immense sea of human torsos and limbs, Scott discovers that this can't continue forever. So he makes Balian make a halfhearted speech about God taking his kingdom back while he will take his people somewhere else. And the high point of the entire movie is thus culminated into an unconvincing mumble. If your tastes match even remotely those of Hannibal Letcher, you are welcome to the show. But if, in this historical saga, you are looking for other, lesser things like glory, valor, and even history, stick to your school books. fullhyd.com has 700,000+ monthly visits. Tell Hyderabad what you feel about Kingdom Of Heaven!